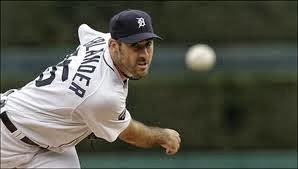 On Wings of Eagles: What if Justin Verlander Called You? What if Justin Verlander Called You? Let's pretend that one day along about the middle of April, your spouse (if you have one) or parent hands you the cordless and says, "It's Justin Verlander." You are sipping lemonade at the time and lounging in a hammock you purchased on sale at Wal-Mart when it dropped below 20 bucks. Taking the phone, you jam it to your ear and say, "Yeah right, who is this, and what do you want?" Silence. Then you hear the voice you've heard on TV. You picture a grin you've seen while he pitches another great game or stirkes out the side in order. "Will you play catch with ?" Asks Justin. "I’m free at one PM." "Urn ...uh..." you stammer. "Well, ahem-"
"It's just me and a few friends." "F-f- friends?" Your tongue will not cooperate. Amid the shock, you hear him mention a few of his buddies. Some guys named Scherzer and Cabrera. He says the three of them just want to hang out a bit. Get to know you. "Where do we land the helicopter?" He asks. You are having trouble responding for two reasons: There is lemonade up your nose. And you have fallen out of the hammock. "Uh, you can land it at the hospital," you manage. "I'll meet you there. I think I'm having a heart attack." Ridiculous, you say. That could never happen. And you're probably right. The odds of Justin calling your house today are the same as the odds of being hit by a falling coconut in Nome, Alaska. After all, One of the all-time great pitchers wouldn't stoop to play with the likes of us, would he? Take that invitation today and walk with the master of the universe today. Dear Lord, thank You that before time was You knew us by name. Thank You that You are always willing to spend time with us, help us to take the time to spend with You. In Jesus’ Name, Amen. Are You To Busy To Share God's Love? Don't Forget Your True Purpose in Life. Are You Trying to Improve the Plan of Salvation? Why Wasn't My Name Called?